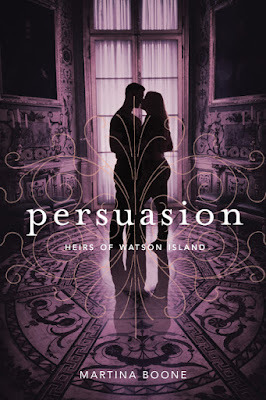 Happy book birthday to PERSUASION! I can't believe it's HERE. In some ways, it's been a long time coming, and in other ways, it feels like COMPULSION just came out. There are so many people who made this book possible, so today is dedicated to them. My amazing critique partners and readers, especially Erin Cashman, Susan Sipal, and Lisa Gail Green, and the incredible and generous beta readers from my street team. To my editors at Pulse, Annette Pollert, Sara Sargent, and Jennifer Ung, to my incredible agent, Jessica Regel. And to EVERYONE at Simon & Schuster and Simon Pulse, for their support, faith, patience, and generosity. To the marvelous team at JKS Communications, and to my blog partners here for being supportive and patient and not throwing things at me when I get too overwhelmed to do what I need to do. Thanks also to all of you for coming along with me on this journey! If you're thinking of getting Persuasion, today's a great time to do it. It can make a big difference to the book, AND there are pre-order incentives still in place through the end of the week. 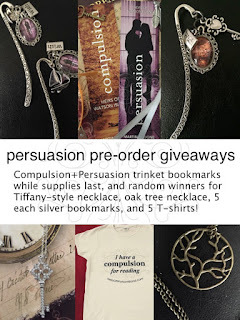 Get Compulsion AND Persuasion trinket bookmarks while supplies last, plus random winners get a Tiffany-style necklace, oak tree necklace, one of five silver bookmarks or one of five Compulsion for Reading T-shirts. 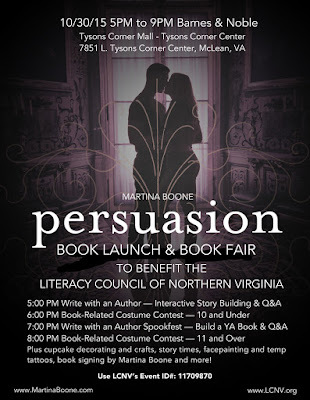 Launch party and fundraiser for the Literacy Council of Northern Virginia! 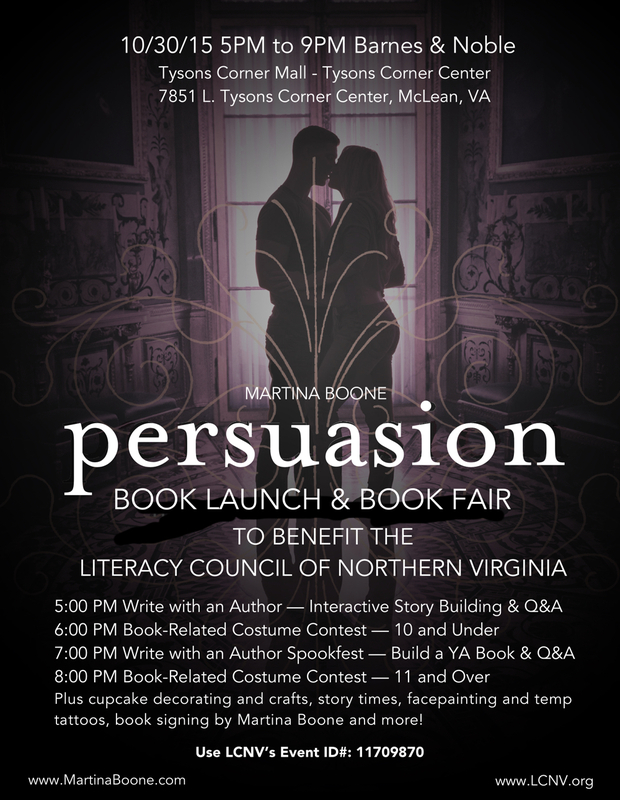 Instead of the traditional launch for Persuasion, I'm helping to raise funds for the Literacy Council, a ground-breaking and award-winning organization dedicated to adult literacy. Join me on October 30 from 5-9 PM at Barnes & Noble in the Tyson's Corner Mall. There will be fun for all ages, including two age-divided costume contests, face painting, cupcake decorating, bookmark-making, Q&As, two impromptu story writing session where I'll create a story with the audience on the fly, and more. Lots of fun and prizes, so come out and bring your friends! Can't come? Order your holiday gifts online! If you enter the event ID number (#11709870), a percentage of all purchases made that day – online or in store – will benefit LCNV. 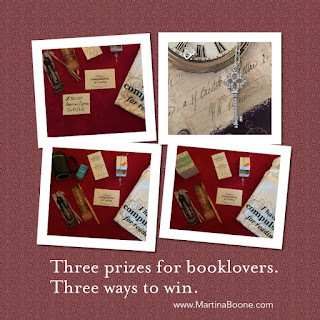 Three ways to win prizes including a $50 gift card, one of three Tiffany-style necklaces, and LOTS, lots more. Plus there are free downloadable bookmarks, door hangers, wallpapers and more. In the Heirs of Watson Island books, Barrie Watson has a gift for finding lost things. And since Eight Beaufort’s gift is knowing what Barrie wants, when Barrie needs to develop her gift and test its limits in Persuasion, Eight gives her a book of word search puzzles. 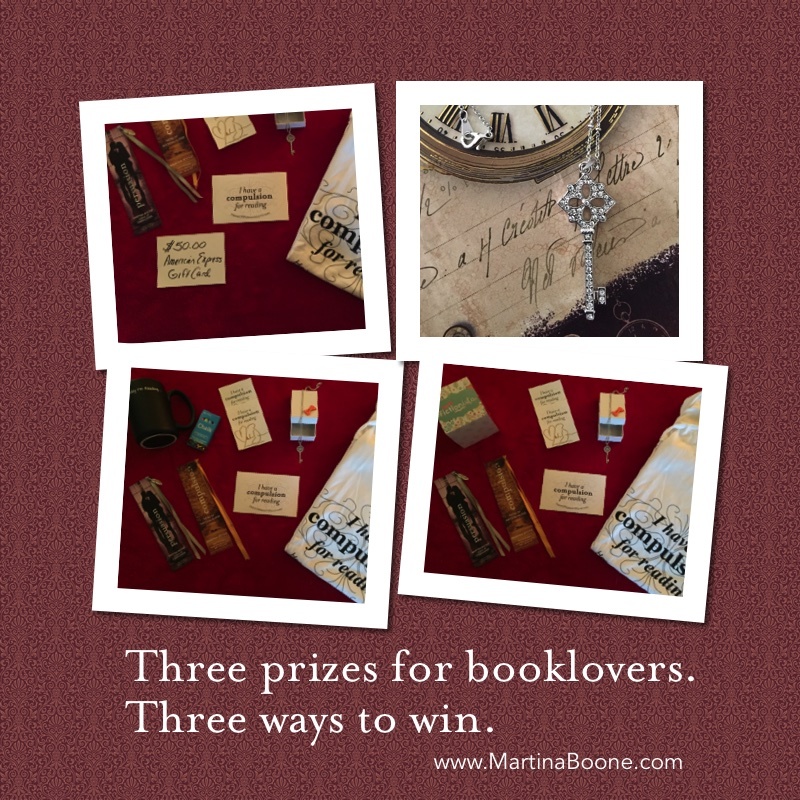 To test your own finding gift, you can play along to win prizes and/or download free wallpapers, stickers, origami bookmarks, door hangers, and more! Know an underfunded classroom, school, or library? I'm so happy to be able to say that the Compulsion For Reading campaign is expanding. This month, we have seven authors and/or bloggers participating, so we're sending out seven packages of books to the teachers and librarians who not only can use them, but areusing books to reach teens and get them excited about reading. I need to send out a huge shoutout to Vivi Barnes, Tara Dairman, Sara Jude, Jen Malone, Mary Elizabeth Summer, and Anna Weimer for offering up packages for the campaign this month. Check out the amazing packages they are offering! 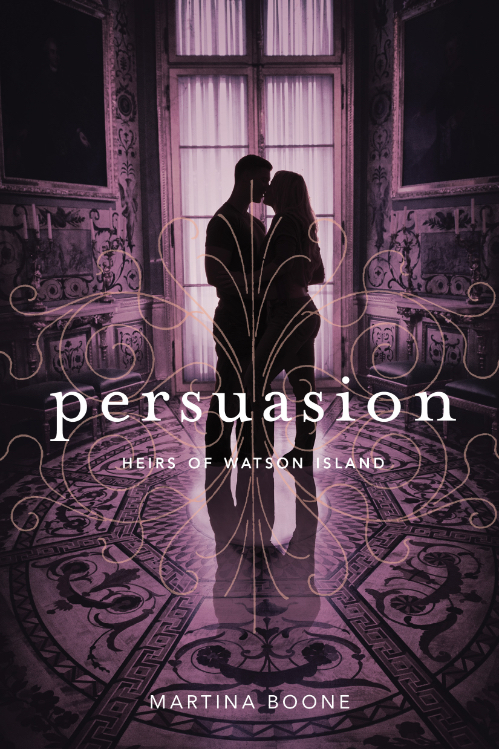 There are two incredible blog tours going on for PERSUASION, complete with amazing prizes and tons of information you've never heard or seen anywhere about PERSUASION and the series as a whole. Here are a few more notes from readers! Thanks, Rosi! Aren't they generous?! Thank you, Wendy! Much appreciated! Congratulations, Martina! I'm so proud of you for all your hard work and giving and proud to know you!